The European Union funded housing project with a financial envelope of €14.7 Million, made further progress during this year. Launched in January 2016 and jointly implemented by Habitat for Humanity and World Vision Lanka, the project will benefit 215,000 people. The inauguration ceremony of the EU project took place on 15th February 2017 in Kilinochchi and Mullaitivu, which was attended by the Ambassador to Sri Lanka and the Maldives for the Delegation of the European Union (EU), H.E. Mr. Tung-Laï Margue. Speaking during the inauguration ceremony, Ambassador to Sri Lanka and the Maldives for the Delegation of the European Union (EU), HE Tung-Laï Margue said, “I am hopeful that this project will assist in providing returnee families with not just homes and livelihood alternatives but also the necessary support to rebuild a life and a future for themselves. The goal has always been to turn the cycle of impoverishment and reliance to that of self-sufficiency, and I am encouraged to see that we are moving in the right direction through this initiative”. 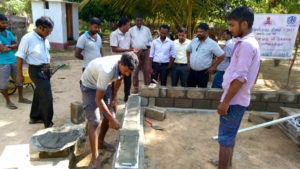 The project, which intends to bridge the gap between relief, rehabilitation and development, aims to build 2,315 houses and repair 140 homes in 31 divisions for internally displaced persons and returnees across Batticaloa, Kilinochchi and Mullaitivu District. 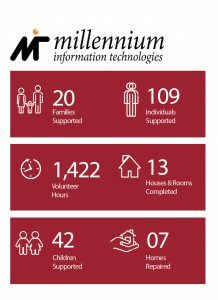 In the year under review, the selection of beneficiaries was completed. Additionally, disbursements to the beneficiaries have been made and construction activities have duly commenced in the year under review. 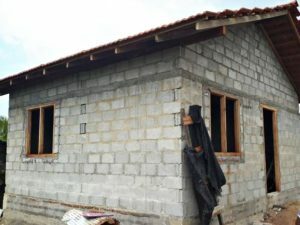 Building on the growing focus on sustainability, Habitat for Humanity has contracted suppliers of alternate materials and techniques which will not only result in the use of locally manufactured earth blocks and construction materials, but will also promote sustainable construction methods and reduce construction costs. “The project is aptly entitled ‘Homes not Houses’. Indeed we wish to see thriving communities that are self-sufficient, stable and strong, once our building work is done and we are long gone. Thanks to the focus of this funding from the European Union the project aims to boost the local economy by investing in earth-based technologies which are cost-effective and sustainable,” said Torre Nelson, Area Vice President for Europe, Middle East and Africa at Habitat for Humanity. Habitat for Humanity Sri Lanka is proud to be a key player in the implementation of this project which is very much aligned to our vision of creating a world where everyone has a decent place to live. • Access to permanent housing for people in the war-torn East of Sri Lanka. • Homes built using sustainable and innovative materials such as compressed stabilised earth blocks and earth concrete blocks. • Appropriate incremental building through microcredit to expand a home or create a place of business. • “Flanking measures” relating to general livelihood support for families and communities such as vocational training in construction, training in appropriate building materials and methods, and forming and strengthening small and medium enterprises to be provided by World Vision Lanka. • Training families in financial literacy including savings plans, microfinance and basics of business. • Improved access to appropriate microfinance and management of debt. • A more holistic approach of strengthening community-based organisations, supporting disaster risk reduction, peace building and gender equity. 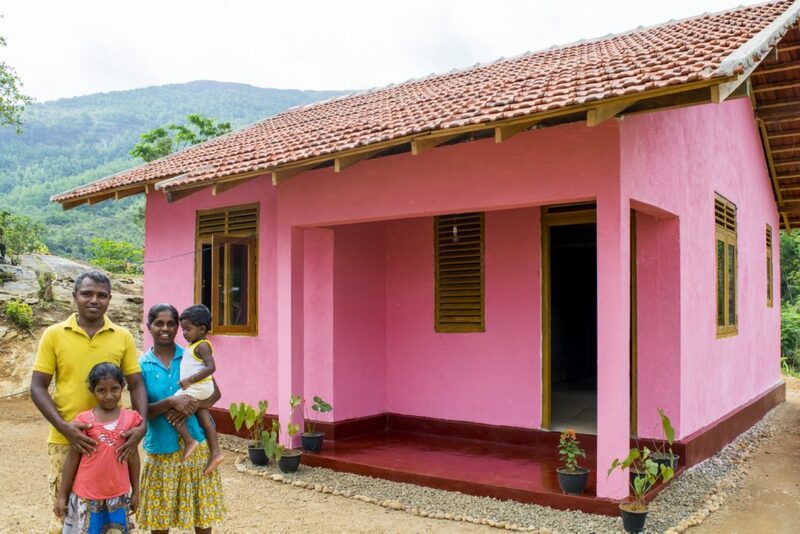 Habitat for Humanity Sri Lanka has successfully completed the construction of 3,713 houses in Trincomalee and Batticaloa for Internally Displaced Persons (IDPs) as part of the Indian Housing Project in 2016. Once again, our home-owner driven construction model witnessed a fulfilling partnership between the organization and the homeowners. Consequent to the successful completion of this project, Habitat for Humanity Sri Lanka signed a Memorandum of Understanding with the Indian Government to implement a housing project for 350 Plantation Sector workers in Sri Lanka. The High Commission of India will spearhead the project to construct 4,000 homes for plantation workers in the Central and Uva Provinces of the country. 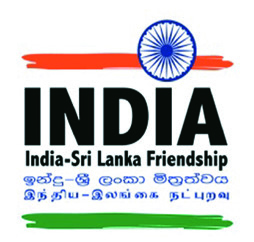 This project constitutes part of the Government of India’s commitment to construct 50,000 homes in Sri Lanka. Habitat Sri Lanka in consultation with the High Commission of India in Sri Lanka, the Ministry of Hill Country, New Villages and Infrastructure and Community Development, local authorities, the Plantation Human Development Trust (PHDT) and estate management has commenced the process of constructing 100 homes for plantation workers in the Hellboda Estate, Pussellawa in the District of Kandy. As part of this project 550 sq.ft. houses will be constructed for families under the accompanied home owner driven approach. This approach encourages homeowners to take ownership of their homes, with extensive orientation and training given on technical aspects and house lifecycle management. The participatory method of decision-making within this approach helps homeowners to develop their skills and self-reliance. 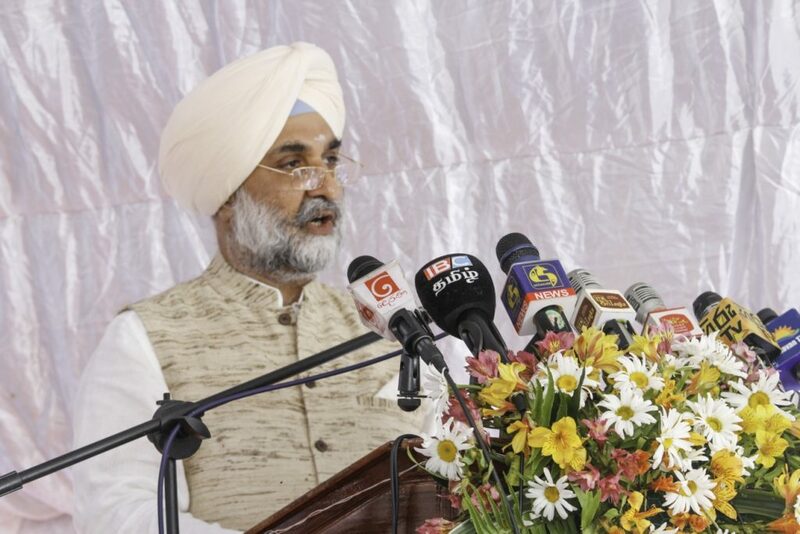 The groundbreaking ceremony for the project was held on 3rd June 2017 and was attended by the His Excellency Taranjit Singh Sandhu (High Commissioner of India in Sri Lanka), Hon. P. Thigambaram MP (Minister of Hill Country New Villages, Infrastructure & Community Development), Hon. Mano Ganesan MP (Minister of National Co-Existence Dialogue and Official Languages) and Hon. V.S. Radhakrishnan MP (State Minister of Education). • First targeted project for estate workers handled by Habitat for Humanity Sri Lanka. to an innovative homeowner-driven model, wherein the Government of India, through its partners arranges technical support and financial assistance for the beneficiaries to undertake the construction of their homes themselves, encouraging homeowners to feel a sense of pride and ownership over their homes. Habitat for Humanity Sri Lanka partnered with Alwaleed Philanthropies in an initiative to rebuild the lives of families affected by landslides caused by Cyclone Roanu, in May 2016. Together with the Government of Sri Lanka, District Secretariat of Kegalle and Divisional Secretaries of Aranayake, Yatiyantota and Deraniyagala, 80 families were identified as key beneficiaries for the rebuilding initiative. more than 200 deaths, and displacing close to 300,000 others. The estimated destruction and damage across Sri Lanka reached 250–280 billion (US$1.7–2 billion) in total, including the loss of homes and livelihoods. by providing a LKR 80 Million (USD 545,200) grant to construct 80 homes for victims of the landslides. 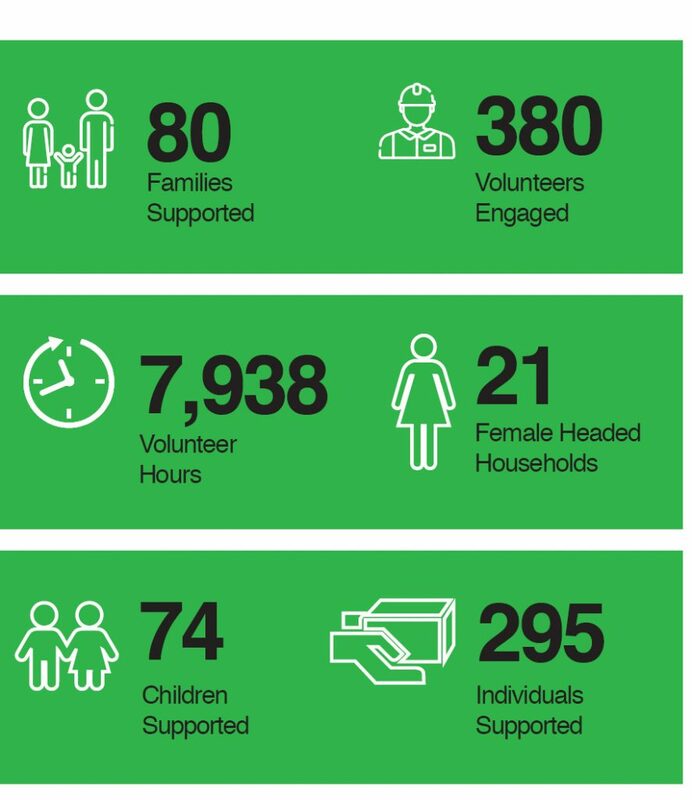 Alwaleed Philanthroies supports emergency and disaster relief and reponse worldwide, regardless of gender, race or religion, of the people affected bt the disaster. It is the philanthropic arm of Prince Alwaleed bin Talal bin Abdulaziz of the Saudi Arabian Royal family. A Memorandum of Understanding between Habitat for Humanity Sri Lanka and the Government of Sri Lanka’s agents in Aranayake and Yatiyantota was signed in December 2016. Through the Kegalle Housing Project, Habitat for Humanity Sri Lanka has pledged to construct 40 houses for the victims of landslides in Kalugala, Aranayake, 23 houses in Illukthenna Estate, Deraniyagala followed by the construction of 17 houses in Yatiyantota. The new houses will be stronger and better prepared for future disasters. The Jersey Overseas Aid Commission (JOAC) funded GBP 100,000 project titled ‘Provision of clean water, latrines and WaSH training came to a successful conclusion in June 2017. 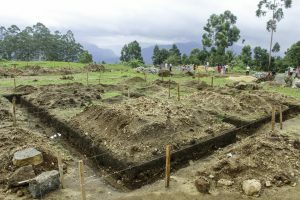 The project which was undertaken by Habitat for Humanity Sri Lanka in partnership with Habitat for Humanity Great Britain in April 2016 was aimed at providing access to water, adequate sanitation and hygiene (WaSH) facilities and training to two neighbouring rural villages in the Matale District. Located in the mountainous terrain of the Central Province of Sri Lanka, this project sought to address the needs of the vulnerable communities inhabiting these two villages, who have limited access to clean water and lack awareness regarding basic WASH practices. 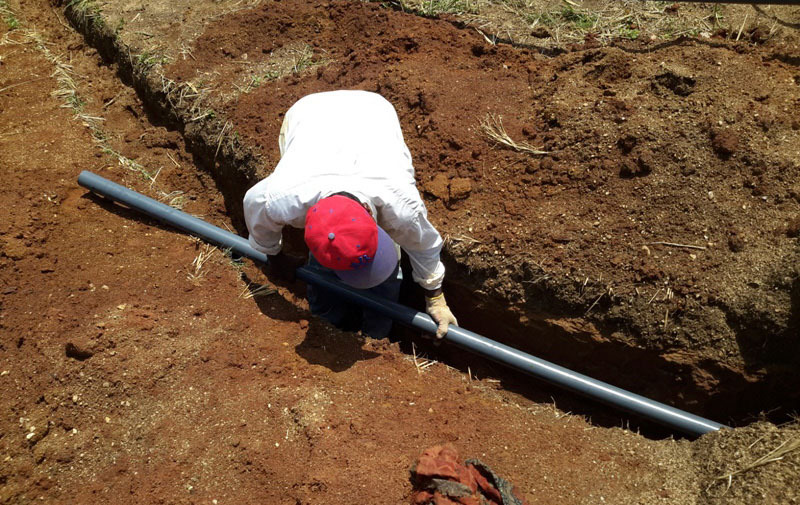 This project successfully facilitated access to clean water for over 1,300 people living below the national poverty line in the villages of Navarathnegoda and Bandarapola. 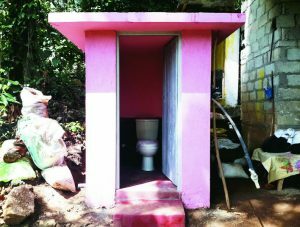 Sanitation facilities were built for 82 families living in these villages; while a further 12 sanitation facilities were built in the two main schools identified in Navarathnegoda and Bandarapola villages. This project also aimed at educating and raising awareness among the residents of these two villages and Community Based Organizations (CBOs) on the benefits of clean water and sanitation. 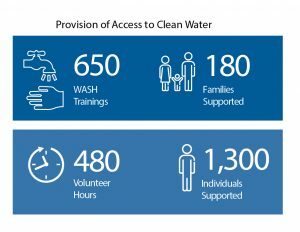 More than 650 individuals benefited from the WASH training conducted under the auspices of this project. 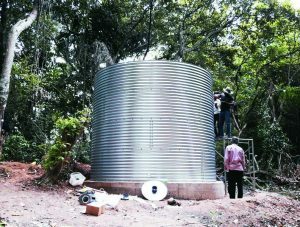 In the target community of Navarathnegoda, prior to the implementation of this project, the closest source of water was rife with hazards. The only path it could be reached through was narrow and steep and residents had reported numerous snake and wild boar attacks along this trail. Some residents were only able to collect water twice during the week. This water was used sparingly and members of the same family were forced to re-use dirty water to bathe. This had caused the outbreak of a number of water-borne diseases in the community. There was also a high incidence of kidney disease due to the lack of drinking water. The implementation of this water, sanitation and hygiene project has provided the families and students in the Navarathnegoda and Bandarapola communities with much needed access to clean water and hygienic sanitation facilities which will no doubt impact the health and living conditions of these families, students as well as future generations. • Construction of 82 latrines across both villages. 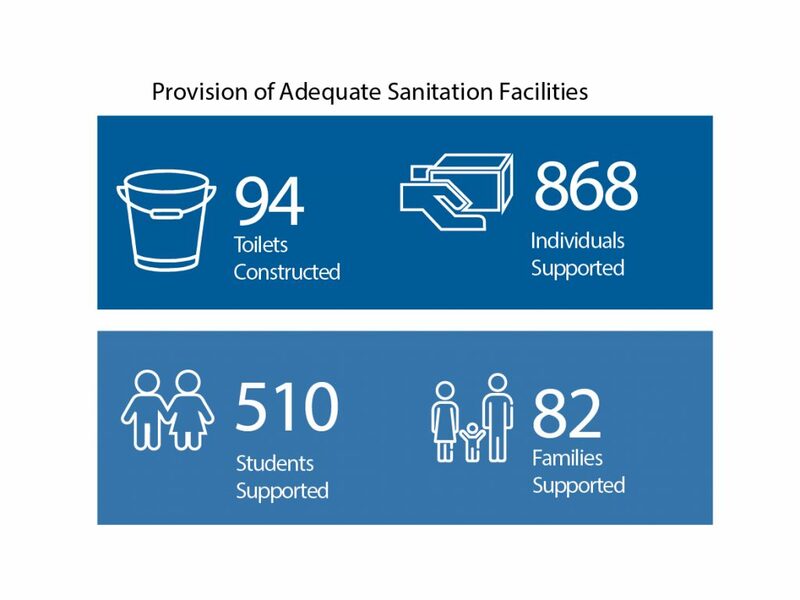 • Construction of 12 latrines in two main schools belonging to both villages – providing more than 500 students with access to adequate sanitation facilities. • Providing essential WaSH training to the residents of both villages and Community Based Organizations (CBOs). • Raising awareness on good sanitation and hygiene practices among the communities. • Reducing the possibility of individuals in these areas contracting disease and illnesses due to consumption of polluted water. • Construction of a water pump and external pipe system to enable water transportation to an easily accessible water tank. Sri Lanka was severely hit by Cyclone Roanu in early May 2016 which ravaged many parts of Sri Lanka, causing landslides and heavy flooding, leaving thousands displaced. 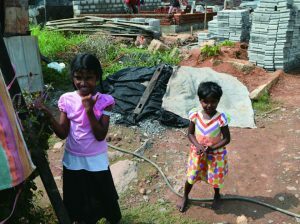 To help rebuild lives, Habitat for Humanity Sri Lanka has partnered with two Corporates to reconstruct the homes of employees whose families had been severely affected by the floods and landslides. Habitat for Humanity Sri Lanka partnered with Brandix Lanka Limited to assist in the re-building and repair of the homes of 13 Brandix employees adversely affected by the floods and landslides caused by the tropical storm Roanu which struck Sri Lanka in May 2016. Habitat for Humanity Sri Lanka monitored, managed and implemented the project while Brandix Lanka Limited funded this project.